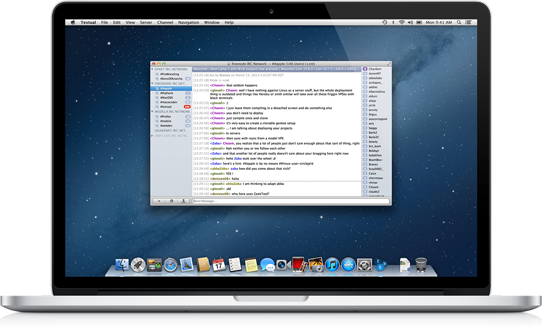 IRC Clients for OS X can be divided in to two broad categories – Free Software and Non-Free Software. Among the Non-Free Softwares there are paid softwares. Free Software here means the softwares which has GNU GPL 3.0 or compatible License. We are mainly interested about there Free IRC Clients for OS X. You possibly has came to this webpage to find the best IRC Clients for OS X, not to read a big lecture note on IRC Chat Clients! So, just one sentence more – if you want to know about IRC then you can read this article on Internet Relay Chat or IRC Details. Internet Relay Chat or IRC is still used in software development and other projects including DMOZ, WordPress core development, Linux development etc. In case of DMOZ, this is closed, but in case of Open Source compatible projects, they are public and the IRC Log is also available. IRC, by any means, is not outdated. Now, if you want a Paid IRC Clients for OS X, you can take two routes – One is searching on Apple Store and Second is to Donate something to the Developers for a paid support for the above softwares (if they has such facility). The Free Softwares are more than enough for normal usage. This Article Has Been Shared 7157 Times! Podcast Cover Design and the needed PSD not only demands skill of designing but also a good idea about many small technical points including screen resolutions. Push Message to OS X Notification Center for WordPress Website Sounds to be a Complicated Process, But With Our Guide it is Easy Both for the Beginners to Advanced Alike. Cite this article as: Abhishek Ghosh, "IRC Clients for OS X," in The Customize Windows, December 2, 2013, April 20, 2019, https://thecustomizewindows.com/2013/12/irc-clients-os-x/.